This article is about the original 1997 game. For the entire series, see Dungeon Keeper (series). For the 2014 game, see Dungeon Keeper (2014 video game). Dungeon Keeper is a strategy video game developed by Bullfrog Productions and released by Electronic Arts in June 1997 for MS-DOS and Windows 95. In Dungeon Keeper, the player builds and manages a dungeon, protecting it from invading 'hero' characters intent on stealing accumulated treasures, killing monsters, and ultimately the player's demise. The ultimate goal is to conquer the world by destroying the heroic forces and rival dungeon keepers in each realm. A character known as the Avatar (resembling the Avatar from Ultima VIII: Pagan) appears as the final hero. Dungeon Keeper uses Creative Technology's SoundFont technology to enhance its atmosphere. Multiplayer with up to four players is supported using a modem, or over a local network. Dungeon Keeper took over two years to develop, and an expansion pack, a Direct3D version, and a level editor were released. Midway through development, Molyneux decided to leave Bullfrog when the game was complete, which was the motivation for its success. Versions for the Sega Saturn and Sony PlayStation were in development, but cancelled. The game received critical acclaim, with reviewers praising the uniqueness and depth. Dungeon Keeper was re-released on GOG.com in 2011, and on Origin in 2016. A fan-made mod, KeeperFX, was released, which fixes bugs and adds features. Dungeon Keeper was followed by a sequel, Dungeon Keeper 2, in 1999, and influenced games such as Lego Rock Raiders and Ghost Master. The Dungeon Heart represents the Keeper's link to the world. If it is destroyed, the player loses. Along with the heart, the player begins with a small number of imps, the generic work force for dungeon activities: they dig tunnels into the surrounding soil, capture enemy rooms and Portals, mine gold and gems, set traps, and even attack when desperate or threatened. Imps are obtained by using the Create Imp spell. Slapping creatures forces them to work faster temporarily, but removes some of their health. Gold is obtained primarily by digging Gold Seams, and Gem Seams provide an unlimited supply, though take longer to accumulate. Gold is used to build rooms, cast spells, and train creatures. To order the imps to dig a tile, the player need flag the tile. Throughout the game, a "mentor" will advise the player as to various happenings and problems within the dungeon. Dungeon Keeper was developed by Bullfrog Productions under Peter Molyneux, who wrote the game design, testbed, and the computer players and assistant. In an interview, Molyneux explained that he came up with the ideas for Dungeon Keeper while sitting in a traffic jam, and become so engrossed in them that when the traffic had moved, he did not notice. Bullfrog's chairman Les Edgar stated that the intention was to use the Dungeons & Dragons theme with "slightly weird Bullfrog humour". Programmers Simon and Dene Carter also said Dungeon Keeper is a parody. Dungeon Keeper is a simulation game because Molyneux viewed the villain's duty as a management exercise. Development began in November 1994 by the lead programmer, Simon Carter, and took two and a half years to develop. The game used the engine for Magic Carpet, and the first version was merely scrolling around a map and entering third-person. The engine was built by Glenn Corpes. Molyneux then developed a 2D prototype containing features that made it into the final game. The prototype focused on constructing the dungeon, and included the Treasure room, Hatchery, Training room, and Dungeon Heart. The characters were designed by the artist, Mark Healey. The navigation system proved difficult to develop because computers of the time lacked power. Artificial intelligence was considered crucial, as the navigation and other aspects relied on it. According to co-designer Jonty Barnes, the team wanted the creatures complex without high computational costs. Healey came up with the idea of slapping creatures to make them work faster, and Barnes considered it a "great game decision". A great deal of time was spent working on the user interface, and at one point the idea of having no interface was considered. Carter stated that the team tried to make the sounds atmospheric and industrial so players got a sense of power. Using others' 3D sound routines proved troublesome, so he and his colleague Tony Cox wrote their own. Dungeon Keeper uses lighting algorithms used in Magic Carpet, which provided effects such as fireballs lighting corridors. Development on the level editor began in May 1995. The first-person view was developed in September 1995, and the creatures had shadows added, which was believed impossible at the time. Around that time, Barnes left the project to complete a degree at the University of East Anglia, and returned in July 1996. In November 1995, Barrie Parker began writing levels, and developed content for the script language. Bullfrog tried to get a version out for Christmas 1995: it was originally scheduled for release in November 1995, and Molyneux, until September, believed that it would be ready by Christmas. He explained that it was mostly complete, but wanted to make sure that it was "absolutely brilliant". It was then the development team realised the game should focus on a living world created by the player. A December 1995 PC Zone preview reported a feature that would have let the computer take control of the player's dungeon after logging out of an internet multiplayer game. In February 1996, Molyneux decided to focus on the project full-time. According to Carter, the creatures were made from bitmaps, and there was around 90 megabytes of graphics data on screen as of April 1996. In July 1996, Alex Peters joined the project and ported the game to Windows 95. Dungeon Keeper was shown at the European Computer Trade Show in September 1996, and was scheduled for release in December. It became evident that the deadline would be missed, and release was pushed back to March 1997. The final testing began in April 1997, and Dungeon Keeper was signed off in June. Dungeon Keeper was released by Electronic Arts in June 1997 for Windows 95 and MS-DOS. Sega Saturn and Sony PlayStation versions were in development and due for release in 1997, but cancelled. An internet version was in development, and would have supported up to 250 players. Carter wrote and organised 800,000 lines of code. Richard Ridings provided voice-overs such as the mentor. The music was composed by Russell Shaw and, according to Healey, this came late in development. The prospect of working on Dungeon Keeper motivated artist and former Bullfrog employee Gary Carr to return from The Bitmap Brothers (he had left Bullfrog because of a disagreement with Molyneux on Theme Park), but he was assigned to Theme Hospital instead. Healey produced 90 per cent of the graphics. Most of the creatures were the team members' ideas, although Molyneux was involved with the Imps. Healey designed the Horned Reaper (who is based on an ex-girlfriend of his), who ultimately become the game's mascot. According to Molyneux, each character takes 1024 bytes of memory. The game as it ended up was developed mostly in the final few months: the team started again from scratch long into the development cycle because they felt it played like Command & Conquer. Before the redesign, instead of having Imps dig the gold and minions entering through portals, the game had the player dig gold himself, and use it and mana to create minions. The redesign included the replacement of the 3D graphics engine with a 2D one and the rewriting of the user interface. Molyneux was impressed with the creature's navigation code: he stated that it is the largest piece of code, and that players could change the map repeatedly and creatures will still find routes to their destinations. Molyneux also liked the fact that the game adapts to the player, enabling the choice of the preferred methods and strategies, and stated that his favourite part of the game is how the player digs out rather than build up, meaning the player has heavy involvement in building the level. He stated that he was proud of Dungeon Keeper's concept, but remarked that doing original things takes time. He also liked that people were unable to describe Dungeon Keeper in any particular way. Molyneux disliked the user interface, saying the team overdid the control panel, and commented that it was a reminder that the player was playing a video game. This was a key reason the user interface of his next video game, Black & White, did not feature panels, buttons, or icons. Molyneux also disliked the lack of opponent personality, and some features being hidden too well, including (according to him) a cheat code that made the mistress creature naked. In a 2000 Game Developers Conference demonstration of Black & White, he stated that it remained undiscovered. Dungeon Keeper was Molyneux's final project with Bullfrog before he left in July 1997 to form Lionhead Studios, and after completion, he stated that he wanted to make "the coolest game ever". Molyneux decided to leave Bullfrog in July 1996 due to frustration over corporate meetings and other management responsibilities that ensued after it was sold to Electronic Arts in 1995. He intended to leave as soon as Dungeon Keeper was complete, and his departure was one reason he wanted to make the game good. As a result of Molyneux's decision, Electronic Arts asked him to leave its offices, but Molyneux wanted to continue development, so the team moved into his house. Molyneux, Mark Webley, Tim Rance, and Steve Jackson made the decision to found Lionhead when Dungeon Keeper was nearing completion. In 2017, Molyneux expressed regret at leaving Bullfrog, and explained that he was drunk when he handed his notice in, and that it was "such a silly thing to do". An expansion pack, The Deeper Dungeons, was released on 30 November 1997. It features fifteen new levels each for single player and multiplayer, and an improved artificial intelligence for the enemies. The Avatar also reappears in the final level. A Direct3D version, which brought improved graphics and 3D acceleration support, and a level editor were released for the game. These add-ons, along with the Deeper Dungeons and a Dungeon Keeper-based desktop theme, were bundled with the game, re-released as Dungeon Keeper Gold Edition in 1998. Dungeon Keeper received a fan-made mod, called KeeperFX. This mod increases compatibility with later versions of Windows, fixes bugs, and adds features such as TCP/IP multiplayer support. A sequel, Dungeon Keeper 2 was released in 1999, and the series was rebooted by Mythic Entertainment with the release of a remake (also titled Dungeon Keeper) for iOS and Android on 30 January 2014. 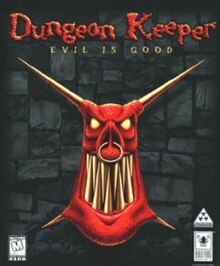 Dungeon Keeper was released in Japan as Dungeon Keeper Premium,[a] under the EA Best Selection brand, and re-released into digital distribution on GOG.com on June 2011. GOG.com launched a macOS version in October 2012. The game was available there free of charge for a few days in February 2014. In October 2016, Dungeon Keeper was released free of charge on Origin, via its "On The House" programme. Dungeon Keeper received critical acclaim. The gameplay and uniqueness were its most heavily complimented aspects. Chris Lombardi of Computer Gaming World praised the multiplayer mode, saying that it "promises to be extraordinarily rich and subtle". His conclusion was that Dungeon Keeper is "The most unique game in years; stylish, multifaceted, and as deep as the pits of hell". Game Revolution's reviewer agreed with Lombardi by believing that "Dungeon Keeper is a revolutionary, terrific game", and also complimented the "terrific" graphics and the "nearly as impressive" sound. Gamezilla's Chris McDonald called the game a "classic" and concluded, "Any real-time gamer with a yearning for the dungeon life and the nerve to slaughter an army of Monks, Fairies and Lords will be pleasantly surprised with Dungeon Keeper". PC Gamer UK's James Flynn praised Bullfrog's attention to detail, calling it "amazing", and reiterated others' views by describing Dungeon Keeper as "A stunning achievement". In a 2001 review, PC Zone, like Gamezilla, called the game "classic", but also criticised its "repetitive" gameplay. Trent Ward of GameSpot remarked "It's a rich strategy game that is both intuitive and challenging, both innovative and polished", and felt the game was "among the best games released so far this year". Gamezilla and PC Zone's beliefs were echoed by a reviewer of Edge, who described the game as a "masterpiece". Another reviewer who agreed was from Computer and Video Games. He described Dungeon Keeper as "totally awesome! ", and praised the flexibility and detail. A reviewer of Jeuxvideo.com commended the replayability and sound effects. Robert Mayer of Computer Games Strategy Plus complimented the humour, sound, and the 3D view, and liked the elements working together, but criticised the artificial intelligence. Next Generation's reviewer lauded the sense of humour, describing it as typical of Bullfrog, the "dark and edgy" soundtrack, further saying it mixes mediaeval themes with guitar sounds, and the gameplay's addictiveness. The only criticism was the "occasionally weak" artificial intelligence. Reviewers from the French magazine Génération 4 were highly complimentary: one reviewer commented that Dungeon Keeper is in-between Warcraft and Theme Park due to its creature management and real-time combat, and also believed that it is hard to leave a level after winning. Another reviewer described Dungeon Keeper as "The game of the year!". The magazine also listed Dungeon Keeper as their top PC CD game of summer 1997. Dungeon Keeper was a finalist in the Software Publishers Association's 13th Annual Excellence in Software Awards Best of 1997 Codie awards for Best Strategy Software Game. In 1997, Dungeon Keeper appeared #4 on PC Gamer's list of top 100 games, and, in June, was named as their Game Of The Month. In June 2014, The Guardian listed Dungeon Keeper as one of Britain's 30 greatest video games. During 1997, Dungeon Keeper sold 113,407 copies in the United States alone. It received a "Gold" award from the Verband der Unterhaltungssoftware Deutschland (VUD) in August 1998, for sales of at least 100,000 units across Germany, Austria and Switzerland. The game's global sales reached 700,000 copies by 2003. Molyneux considered it a "missed opportunity" in comparison to his earlier games such as Theme Park, which sold millions of units. 1999's Lego Rock Raiders. According to Retro Gamer, this was asserted to be "the ultimate sequel to Dungeon Keeper". 2001's Startopia. This game was developed by Mucky Foot Productions, which consisted of staff from Bullfrog. Retro Gamer said that "they'd taken Dungeon Keeper and set it in space". 2004's Evil Genius, the second game developed by Elixir Studios. Players control a James Bond-style lair and construct military and scientific installations, with the goal of expansion. 2006's Ghost Master, in which players play the role of the enemy. 2007's Holy Invasion of Privacy, Badman!, another game in which players construct a dungeon and protect it from invading heroes. It was described as "Dungeon Keeper meets Dig Dug". 2011's Dungeons but with focus on care of the heroes instead of the monsters. 2011's Dungeon Overlord, an Adobe Flash application via the social-networking website Facebook. 2013's Impire has been called "Dungeon Keeper with a side of Dawn of War". 2013's The Mighty Quest for Epic Loot has been called "A weird combination of Diablo and Dungeon Keeper". 2015's War for the Overworld is a project held by its creators Subterranean Games as "a true spiritual successor to Dungeon Keeper". 2015's Dungeons 2 has been described as a combination between "Dungeon Keeper and an RTS". Dungeon Keeper was referenced in Theme Hospital's introduction scene twice: a doctor is briefly seen playing a console version, and the Horned Reaper makes a cameo appearance as a patient. Early concept art for Black & White used Dungeon Keeper's Horned Reaper to represent creatures. The Horned Reaper unit was so popular that the producers of Dungeon Keeper 2 made it a character with an important role in the game's story. Dungeon Keeper's engine was an inspiration for Minecraft. ^ "Dungeon Keeper on PC". GameSpot.com. Archived from the original on 22 January 2009. Retrieved 14 February 2008. ^ Dungeon Keeper Premium Guide Book, pp. 2–14. ^ Rick Lane (14 February 2016). "Remember when Dungeon Keeper was good?". Eurogamer. Retrieved 31 October 2016. ^ "Cheap As Chips: Dungeon Keeper". Retro Gamer. No. 104. Bournemouth: Imagine Publishing. p. 30. ISSN 1742-3155. ^ a b c Meer, Alec (7 August 2010). "Why Dungeon Keeper has never been beaten". PC Gamer. Retrieved 16 May 2016. ^ Official Guide Book, p. 92. ^ Dungeon Keeper Premium Guide Book, pp.22–24. ^ a b c Manual, p. 25. ^ a b Alec Meer (7 January 2013). "War For The Overworld Recruits Dungeon Keeper's Voice". Rock, Paper, Shotgun. Retrieved 30 October 2017. ^ Dungeon Keeper Premium Guide Book, pp. 37–41. ^ Official Guide Book, pp. 13,20,116,117. ^ Official Guide Book, pp. 129–133. ^ Dungeon Keeper Premium Guide Book, p. 24. ^ Official Guide Book, pp. 53,67. ^ Official Guide Book, p. 37. ^ Official Guide Book, pp. 43–75. ^ Official Guide Book, pp. 119–124. ^ Official Guide Book, pp. 32–34,42–89. ^ Official Guide Book, p. 95. ^ Official Guide Book, pp. 92,94. ^ a b Dungeon Keeper Premium Guide Book, p. 46. ^ Official Guide Book, pp. 144–221. ^ Official Guide Book, pp. 138,139,222–232. ^ Dungeon Keeper Premium Guide Book, pp. 42–44. ^ Dungeon Keeper Premium Guide Book, p. 43. ^ "The best releases of the last two months...". PC Gamer. Vol. 1 no. 7. Bath: Future plc. June 1994. p. 25. ISSN 1470-1693. ^ Dungeon Keeper Premium Guide Book, p. 44. ^ Official Guide Book, pp. 89,214–221. ^ Dungeon Keeper Premium Guide Book, pp. 44,86,87. ^ a b Dungeon Keeper Premium Guide Book, p. 94. ^ a b c Lombardi, Chris (October 1997). "Dungeon Keeper: it Brings Bad Things to Life" (PDF). Computer Gaming World. No. 159. p. 261. ISSN 0744-6667. Retrieved 13 May 2016. ^ Official Guide Book, pp. 234–249. ^ a b Official Guide Book, p. 252. ^ a b c Official Guide Book, p. 253. ^ "An Audience With Les Edgar". Audience. Edge. No. 74. Bath: Future plc. August 1999. pp. 120–125. ISSN 1350-1593. ^ a b c "Elf Destruction". Bullfrog Bulletin. No. 2. Guildford: Bullfrog Productions. 1995. pp. 4–6. ^ a b c d e f g h Official Guide Book, p. 264. ^ a b c d e f g h i j k l "The Making Of: Dungeon Keeper". Retro Gamer. No. 143. Bournemouth: Imagine Publishing. pp. 64–69. ISSN 1742-3155. ^ a b "In The Chair With Glenn Corpes". Retro Gamer. No. 160. Bournemouth: Imagine Publishing. October 2016. pp. 92–97. ISSN 1742-3155. ^ a b "Bullfrog". Edge. No. 22. Bath: Future plc. July 1995. pp. 25–27. ISSN 1350-1593. ^ Official Guide Book, p. 259. ^ a b c d Simon Carter (August 1996). "Dungeon Keeper Full Preview". Archived from the original on 23 March 2003. Retrieved 5 March 2017. ^ "Dungeon Keeper". Blueprint. PC Zone. No. 33. London: Dennis Publishing. December 1995. pp. 28–30. ISSN 0967-8220. ^ a b c "Dungeon Keeper". Computer and Video Games. No. 188. Peterborough: EMAP. July 1997. pp. 70–73. ISSN 0261-3697. ^ a b c Robert Mayer (1997). "Dungeon Keeper". Computer Games Strategy Plus. Computer Games Strategy Plus. Archived from the original on 10 July 2003. Retrieved 20 November 2016. ^ "Killer Bullfrogs Launch Game". News. Mean Machines Sega. No. 36. Peterborough: EMAP. October 1995. p. 12. ISSN 0967-9014. Retrieved 21 October 2016. ^ Leadbetter, Rich (May 1997). "Q&A". Sega Saturn Magazine. No. 19. Emap International Limited. p. 38. ^ "Online Games to watch for:". Next Generation. Vol. 3 no. 27. Imagine Media. p. 39. ISSN 1078-9693. ^ Official Guide Book, p. 254. ^ Dungeon Keeper Interview: Richard Ridings. EA Mobile Games. 5 February 2014. Retrieved 16 May 2015 – via Youtube. ^ Julian Benson (6 January 2013). "War for the Overworld to be narrated by Richard Ridings, the voice of the mentor from Dungeon Keeper". PCGamesN. Retrieved 30 October 2017. ^ a b "Revisiting Bullfrog: 25 Years On". Retro Gamer. No. 110. Bournemouth: Imagine Publishing. December 2012. pp. 60–67. ISSN 1742-3155. ^ "The Making of Theme Hospital". Retro Gamer. No. 130. Bournemouth: Imagine Publishing. June 2014. pp. 46–51. ISSN 1742-3155. ^ a b c "The Making of Dungeon Keeper". NowGamer. 17 April 2009. Retrieved 17 November 2016. ^ "Bullfrog Productions: A History Of The Legendary UK Developer". NowGamer. 22 February 2012. Retrieved 16 July 2017. ^ Ron Dulin. "GameSpot Presents Legends Of Game Design: Peter Molyneux". GameSpot. GameSpot. pp. 11, 12. Archived from the original on 1 September 2003. Retrieved 5 November 2016. ^ a b c "Born-Again Keeper". Bullfrog Bulletin. No. 4. Guildford: Bullfrog Productions. 1997. pp. 8, 9. ^ Molyneux, Peter (13 June 2001). "Postmortem: Lionhead Studios' Black & White". Gamasutra. Retrieved 31 October 2016. ^ a b Peter Molyneux Explains the Design of Black and White. Game Developers Conference. 3 August 2017. Retrieved 12 December 2017 – via YouTube. ^ "An Audience With Peter Molyneux". audience. Edge. No. 47. Bath: Future plc. July 1997. pp. 22–27. ISSN 1350-1593. ^ Alex Osborn (4 April 2017). "Peter Molyneux Departed Bullfrog Over a Drunken Email". IGN. Retrieved 4 April 2017. ^ "Dungeon Keeper Soundfont Technology In Action". Creative Technology. Archived from the original on 9 October 1997. Retrieved 13 May 2016. ^ a b "How to Create a Dungeon Keeper Soundfont Bank". Creative Technology. Archived from the original on 9 October 1997. Retrieved 13 May 2016. ^ "Dungeon Keeper Download a Soundfont Bank". Creative Technology. Archived from the original on 9 October 1997. Retrieved 13 May 2016. ^ "Dungeon Keeper: The Deeper Dungeons on PC". GameSpot.com. Archived from the original on 10 October 2007. Retrieved 14 February 2008. ^ Jason Ocampo (1997). "Delve deeper into Dungeon Keeper". Computer Games Strategy Plus. Computer Games Strategy Plus. Archived from the original on 23 May 2003. Retrieved 20 November 2016. ^ Dungeon Keeper Premium Guide Book, p. 120. ^ Jason Ocampo (27 April 1998). "Dungeon Keeper Gold Edition". Computer Games Strategy Plus. Computer Games Strategy Plus. Archived from the original on 10 July 2003. Retrieved 20 November 2016. ^ Meer, Alec (28 September 2010). "A Deeper Dungeon: Dungeon KeeperFX". Rock Paper Shotgun. Retrieved 16 May 2016. ^ "KeeperFX Readme file". DK Maps'n'Tools Base. Retrieved 16 May 2016. ^ "Dungeon Keeper II – PC". IGN. Retrieved 20 November 2016. ^ "Dungeon Keeper Out Now On Android And iOS". Retro Gamer. 30 January 2014. Retrieved 20 November 2016. ^ "Dungeon Keeper". Electronic Arts Japan (in Japanese). Archived from the original on 20 February 1999. Retrieved 13 May 2016. ^ Walker, John (3 June 2011). "Good Old Games Add Good Old EA Games". Rock, Paper, Shotgun. Retrieved 19 December 2015. ^ Michael McWhertor (18 October 2012). "GOG.com launches Mac OS X support for new and classic games today". Polygon. Retrieved 13 December 2017. ^ Grayson, Nathan (15 February 2014). "Apologies With A Capital EA: Dungeon Keeper Free On GOG". Rock Paper Shotgun. Retrieved 14 May 2016. ^ Adam Smith (7 October 2016). "Keep Forever: Dungeon Keeper Is Free Right Now". Rock, Paper, Shotgun. Retrieved 31 October 2016. ^ "Original Dungeon Keeper now free on Origin". Complete Game Reviews. 7 October 2016. Retrieved 31 October 2016. ^ "Dungeon Keeper for PC". GameRankings. CBS Interactive. Retrieved 14 February 2019. ^ a b "Dungeon Keeper". Testscreen. Edge. No. 46. Bath: Future plc. June 1997. pp. 82, 83. ISSN 1350-1593. ^ a b Ward, Trent (9 July 1997). "Dungeon Keeper Review for PC". GameSpot. Archived from the original on 6 December 2003. Retrieved 16 May 2016. ^ a b "Dungeon Keeper review". Game Revolution. 7 May 1997. Retrieved 13 May 2016. ^ a b "Test : Dungeon Keeper". Jeuxvideo.com (in French). 1 September 2009. Retrieved 31 October 2016. ^ a b c Flynn, James (June 1997). "Dungeon Keeper". PC Gamer. No. 44. Bath: Future plc. pp. 70–73. ISSN 1470-1693. ^ a b "PC Review: Dungeon Keeper". Computer and Video Games. 13 August 2001. Archived from the original on 14 July 2007. Retrieved 15 May 2016. ^ a b McDonald, Chris. "Dungeon Keeper by Bullfrog". Gamezilla. Archived from the original on 8 February 2002. Retrieved 13 May 2016. ^ a b "Dungeon Keeper". Next Generation. Vol. 3 no. 33. Imagine Media. September 1997. p. 140. ISSN 1078-9693. ^ a b c "Dungeon Keeper". Génération 4 (in French). No. 100. June 1997. pp. 160–168. ISSN 1624-1088. ^ "Le top de l'été 1997" [The top of summer 1997]. Génération 4 (in French). No. 101. July 1997. pp. 40, 41. ISSN 1624-1088. ^ "Software Industry Unites in Celebration for 1998 Codie awards". SuperKids. Software Publishers Association. 23 March 1998. Retrieved 17 May 2016. ^ "The PC Gamer Top 100". PC Gamer. No. 45. Bath: Future plc. July 1997. p. 73. ISSN 1470-1693. ^ Simon Parkin; Rich Stanton; Keith Stuart (3 June 2014). "The 30 greatest British video games". The Guardian. Retrieved 31 July 2017. ^ Staff (April 1998). "How Did the PCG Award Winners Fare?". PC Gamer US. Vol. 5 no. 4. p. 45. ^ "Uhr TCM Hannover – ein glänzender Event auf der CebitHome" (Press release) (in German). Verband der Unterhaltungssoftware Deutschland. 26 August 1998. Archived from the original on 13 July 2000. ^ Horn, Andre (14 January 2004). "VUD-Gold-Awards 2003". GamePro Germany (in German). Archived from the original on 18 July 2018. ^ Adams, Ernest; Rollings, Andrew (2003). Andrew Rollings and Ernest Adams on Game Design. New Riders Publishing. pp. 184, 185. ISBN 1-59273-001-9. ^ "Lego Rock Raiders". The Next Level. 2000. Retrieved 25 February 2017. ^ Ron Dulin (19 June 2001). "Startopia Review". GameSpot. Retrieved 25 February 2017. ^ Dan Adams (28 September 2004). "Evil Genius Review". IGN. Archived from the original on 21 March 2011. Retrieved 25 February 2017. ^ Ectal Greenhaw (14 November 2003). "Ghost Master review" (PDF). Inside Mac Games. Retrieved 25 February 2017. ^ a b "Holy Invasion of Privacy, Badman! is the Dungeon Keeper of this Decade". Asian Girl Gamer. 22 October 2009. Archived from the original on 5 January 2010. Retrieved 25 February 2017. ^ Mark Walton (7 February 2011). "Dungeons Review". GameSpot. GameSpot. Retrieved 25 February 2017. Dungeons' mind-numbing, repetitive gameplay never reaches the greatness of Dungeon Keeper, its classic inspiration. ^ Adam Tingle (16 January 2012). "Dungeon Overlord Review: If You Loved Dungeon Keeper..." MMORPG.com. Retrieved 25 February 2017. ^ Fraser Brown (2 February 2013). "Impire is Dungeon Keeper with a side of Dawn of War". Destructoid. Retrieved 25 February 2017. ^ Jeremy Parish (1 June 2013). "The Mighty Quest for Epic Loot: A Competitive Dungeon Crawler That Hates Archers". USGamer. Retrieved 25 February 2017. ^ "Update #11: Kickstarter Demo Release, New Video". War for the Overworld. Retrieved 25 February 2017. ^ Hayden Dingman (24 April 2015). "Dungeons 2". PC World. Retrieved 25 February 2017. ^ James Leach; Christian Bravery (2001). The Making Of Black & White. Roseville, Calif.: Prima Games. p. 16. ISBN 978-0-7615-3625-3. ^ "Lock up your daughters, here comes ... Dungeon Keeper 2". PC Zone. No. 77. London: Dennis Publishing. June 1999. pp. 44–49. ISSN 0967-8220. Melissa Tyler; Shin Kanaoya (1997). Bullfrog's Official Guide to Dungeon Keeper. Prima Publishing. ISBN 978-0-7615-0714-7. Bullfrog (1997). Dungeon Keeper manual. Chertsey: Electronic Arts.